Universal Display was recently awarded a new patent (USPTO #20170186976) that describes high electroluminescent efficiency TADF OLED emitter and host materials based on benzotriazoles. It is very interesting to see UDC developing TADF material. The company is focused on phosphorescent based OLEDs but, as they explain in the patent application, "phosphorescent materials generally contain a rare metal element such as Ir or Pt. These metals are rather expensive and are dependent on limited global resources". TADF could also be a viable route towards an efficient blue emitter (blue-emission is specifically mentioned in UDC's new patent). We reached out to UDC for a comment on this new patent. 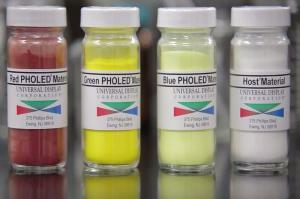 The company says that the focus of the company is still phosphorescent OLED (PHOLED) technology. The company however patents technology invented by its scientists "even if it is outside our focus, like TADF". That may be the case, but it's also possible that UDC is indeed actively researching TADF emitters. As our reader David pointed out in a comment below, the authors of the patent are part of the team that UDC acquired from BASF which means that UDC may just have followed up on a research activity that began at BASF. Besides UDC, TADF is being developed by three other companies. Japan-based Kyulux was established to commercialize Prof. Adachi's HyperFluoresence TADF technology (UDC gives credit to Prof. Adachi's work in the patent application). Germany-based Cynora is focusing on a blue TADF emitter. Both companies aim to release their first commercial materials in late 2017 or early 2018. Idemitsu Kosan also considers TADF as one of the key OLED technologies and intends to focus on TADF in the future (although Idemitsu's actual TADF plans are not clear yet). Although the speculation at the end of this piece might be true, I find that one important piece of information is missing in this otherwise good and interesting story: the inventors of the patent are BASF staff so it was clearly part of the IP deal between UDC and BASF (https://www.oled-info.com/udc-acquires-basfs-oled-ip-96-million) and NOT the result of active research on UDCs side. Taking this and the cited statement adds up to a slightly different story: UDC seem to have followed through with an application they already paid good money for to broaden their portfolio, no more and no less. By the way the patent itself is not breathtaking, it only contains 5 actual molecules or so as examples. I could not find any demonstrated example of the host part of the story and the other examples demonstrate the use of the molecules as mediocre green-to-yellow emitters with uninteresting color points with no reported lifetime data, which is often a bad sign. David - thanks for the input, I did not think about the BASF angle and what you say certainly makes sense! UDC are doing something on TADF - there are several patent applications with inventors based at their Hong Kong labs. I don't know whether this is active "full throttle" research or just putting an IP stake in the ground.